Stalam was established in 1978 in Italy’s North-Eastern Vicenza province, by local investors having a strong background in industrial machinery. In 1990 Mr. Cavestro, Stalam’s Chairman until late 2016, acquired the company leading a group of industrial and private investors, under the name of Stalpart. In 2002, the Italian private equity fund 21 Investimenti, established by Alessandro Benetton - a member of the Benetton family, well known in the textile and fashion business, entered the company with a minority stake and Stalam changed its legal status from limited liability company (S.r.l.) to joint stock company (S.p.A.). 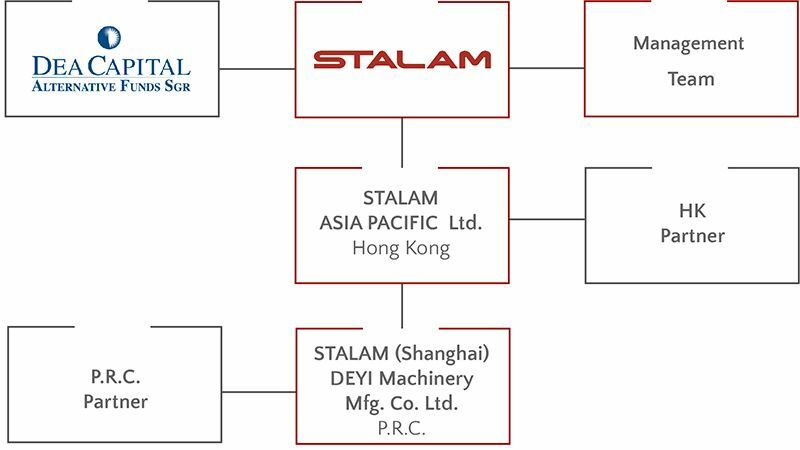 In 2005, Stalam established a j-v company in China, Stalam (Shanghai) DEYI, in partnership with local investors, through Stalam Asia Pacific as the investment vehicle, by acquiring the majority stake of a partially privatised, former state-owned industrial machinery manufacturer. At the end of 2016, IDeA Efficienza Energetica e Sviluppo Sostenibile, the Italian private equity fund specialising in the environmental sustainability sector and controlled by IDeA Capital Funds SGR (DeA Capital Group) has acquired control of Stalam in a management buy-out operation backed by Enrico Zanetti, Managing Director, and other managers who have led the company to success in recent years. The team has been joined by Massimo Bianchi, former General Manager of Gaggia S.p.A. and C.E.O. of various companies in diversified industrial sectors, as the new Chairman.